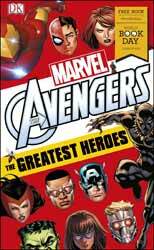 DK Publishing releases Marvel Avengers: The Greatest Heroes, a little book with a big heart. It is a presentation for World Book Day UK 2018 and is priced at only £1. An introduction for young readers to the Marvel universe, it presents full colour artwork and background descriptions for all the superheroes you would expect: Iron Man, Thor, Captain America, Hulk, Falcon, Black Widow, Hawkeye and Scarlet Witch. But it also includes lesser known characters like Luke Cage, Blue Marvel, Captain Britain (which I read as a kid, along with Spider-Man), Quicksilver and Captain Marvel. There are also mentions for Spider-Man, Guardian of the Galaxy, Doctor Strange and S.H.I.E.L.D. You would think that would be all there is space for in a £1 booklet; not so. We then have a villains section with Loki (Thor’s evil half-brother), Ultron (Iron Man’s biggest mistake), and Thanos (the biggest nemesis to The Avengers). There is also a gallery of lesser known bad guys. The book finishes by quizzing the reader on what has gone before, and adding some adverts for larger tomes for the kiddywinks to progress to. The artwork is very good, the data concise and informative. What’s not to like? The World Book UK organisation has distributed 290 million £1 book tokens for young children; what better way to spend it and get reading? This is a shrewd move by Marvel and DK. The ankle biters of today are the serious comic book readers and film-goers of tomorrow.